Workers line up at Social Security Administration booth at job fair in Oak Brook, Illinois, July 2. The number officially unemployed for more than 27 months has risen 170 percent in last year. The rising number of workers who depend on unemployment insurance to meet basic and immediate necessities face increasing delays and mounting red tape from government bureaucracies. The official unemployment rate has doubled over the last year and a half and now stands at 9.5 percent. The real figure is closer to 11 percent if you include workers who are not counted in government figures because, although they have looked for work over the last year, they have not looked for work in the last month. They are labeled marginally attached to the workforce. About 9.5 million workers receive unemployment compensation out of some 17 million jobless (including 2.2 million marginally attached). Applicants must prove, often contrary to employer claims, that they were laid off through no fault of their own and are looking for work. Unemployment covers only a fraction of previous wages. In Texas, for example, the maximum paid is $392 per week, about what someone making $750 a week for the last year would receive. For most workers payments are a lot less. Benefits are running out for a growing number of the 9.5 million eligible to receive them. 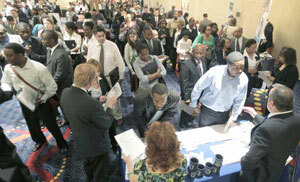 Workers counted as jobless for more than 27 months has risen 170 percent in the last year and now stands at 4.4 million. In most states, eligible workers can receive an initial maximum of 26 weeks of compensation, depending on how long they have worked. Beyond 26 weeks, workers must apply for an extension and more start dropping off the rolls. Last year Congress voted to provide extensions of 20-33 weeks, depending on each states unemployment level. Recently Congress added provisions that allow workers to apply for an additional 13-20 week extension in most states. However, among other restrictions, applicants must provide proof satisfying Labor Department bureaucrats that they have applied and been turned down for lower paying jobs. Ironically, state governments say they dont have enough workers to handle the rising applications for unemployment benefits, resulting in long delays. About a quarter of applicants are scrutinized by a case investigator, which further slows down the decision process. Over the last year only 61 percent of applications in the country were processed within three weeks. More than 850,000 took longer than eight weeks. In California, where unemployment is officially 11.6 percent, only 5 percent of appeals are decided within a month. It is extremely stressful when you dont know how you are going to support your family, Mr. Coronel, a janitor from San Francisco, told the New York Times. He finally received a check after six months: two days of persistently trying to get through to the unemployment office to file an application, one month to learn he was turned down, three months for an initial response to his appeal, and another two months before receiving approval. Increasing delays such as these are one of the factors swelling the ranks of the homeless across the country. Funds gathered from employer taxes and earmarked for unemployment benefits have run out in 16 states so far. These states have been paying unemployment from money loaned by the federal government. Other states are soon to be doing the same. In mid-July, Texas requested $643 million in loans from the U.S. Labor Department to pay unemployment through October 1. Citing technical problems, one Texas official said that on July 13, more than 155,000 callers could not get through to anyone at any of the states four unemployment offices. Texas Workforce Commission spokeswoman Ann Hatchitt initially said due to complex federal requirements those slated for a 13-week extension approved by Congress July 1about 100,000 workerswould need to wait  a couple of months to get paid. An internal e-mail estimated the payments would be sent in November. Tom Pauken, commission chairman, later said the department would sort out whatever is responsible for the long delays by the end of the month.